With paper accounting for an average of 35% of office waste, it is an area that could prompt significant energy savings with the introduction of a green paper policy. Although it was predicted that computer technology would bring about the paper-free office, the use of paper in the workplace is increasing rather than decreasing. This tide of paper use is largely wasteful and can be stemmed with the introduction of an effective green paper policy. The green paper policy is a list of rules about efficient and environmentally friendly paper use that should be agreed by management and adopted by the whole workplace. It is likely that most employees will be enthusiastic about any environmentally friendly schemes and will not need to be coerced or bribed into taking part. Nevertheless the programme should encourage participation by being easy to follow, and introduced with a publicity, discussion and training. Recycling points should be conveniently located near workstations and be clearly labelled with what paper office supplies are recyclable. Photocopiers and printers should feature simple codes and instructions so that staff can operate them efficiently – such as in printing double-sided pages – as well as in keeping them well maintained and avoiding errors that result in paper waste. The green paper policy is not just about reducing paper use but also using environmentally friendly, or ‘green’, paper instead standard paper. 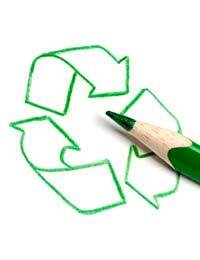 Green paper is any type that has a high recycled content, and with a branded waste content of more than 70%. Its production must also have been completely chlorine free. When purchasing green paper, look out for the environmental certificate or green label that details waste content and emission standards. Whilst recycling paper is certainly good green practice, it is even more eco-efficient to save the cost and carbon emissions associated wit the process by limiting the use of paper and therefore the need to recycle. Cut paper use in half by introducing a policy of double-sided photocopying and printing. Use email and voicemail instead of memos. Create a secondary storage for used but reusable paper that can be for draft print-outs, faxes and note taking. Reuse paper trays should appear next to printers, fax machines and photocopiers and be a fixture of every desk. Proofread documents on screen before printing them out. If you print a multiple page file and then discover errors, use the print option to only reprint the pages that have been changed. Set the document line spacing to no more than 1.5. Arrange publications so there is a minimum of white space, such as by adjusting margin width. One of the purposes of a green policy is not simply publicising the fact that your company is a friend to the environment but in showing what measures have been implemented. If your office issues any publications, for example, then you should always advertise the relevant environmental information such as how it was produced and with what materials. Hopefully this will encourage others to adopt similar standards. Office paper waste is not only made up of that used by the company, it could also feature junk mail that will likely be glanced at and then thrown in the bin. To stop receiving it in the first place you can ask for your name to be removed from the appropriate mailing lists or, alternatively, contact the Mailing Preference Service via their website or telephone line. What Really is a Recycled Product?